Delhi University Student Union, DUSU election 2018 is going to be conducted on Sept 12, 2018. The election fever is in full swing. For the political parties contesting in an election, it is a matter of immense pride to win the student election in one of the largest university in the country. In order to win the election candidates use many malpractices like dividing votes on caste, religion, demography, false promises etc. They also use large chunks of money to pay voter for votes in cash or liquor. They also use dummy candidate. What is a dummy candidate? Why political parties fielded these candidates in the election? Are dummy candidates used in DUSU election? During the election “DUMMY candidates” are being set up by various political parties and candidates in order to hoodwink the ceiling on election expenditure and to further the interest of party candidate. There is no mention about “dummy candidates “ in electoral law. Any candidates who are validly nominated and chooses to remain in the fray is a candidate and these cannot be any distinction between ‘serious candidates’ and ‘dummy candidates’. But the fact remains that the practice of setting exists here and there. Dummy candidates fielded in the election for many reasons like- i) Dummy candidates directly influences the vote shares of serious candidates. ii) Dummy candidates may be used as serious candidates to overcome limits on advertising on the campaign. iii) They can make the margin of winning narrower and may do anything for the sake of money. For example, In 2014, Not that putting up a dummy candidate works, as Congress leader Ajit Jogi famously found out in the 2014 Lok Sabha election. Jogi, who was facing the more-fancied Chandu Lal Sahu of the BJP in the Mahasamund constituency, contrived to put up 10 other dummy candidates – all of them bearing the name Chandu Lal Sahu. Being one of the favorites technique, DUSU can’t be away from this. Last year election in which National student union India(NSUI) won the president and vice president posts. However, the question has been raised on the candidature of one Raja Chaudhary, an independent candidate. He contested election for the president post against ABVP (Akhil Bhartiya Vidyarthi Parishad) candidate Rajat Chaudhary. Not only his name similar sounded similar to ABVP’s candidate, his pamphlet said he represented ABVP(Akhil Bhartiya Vidya Parishad), which is abbreviated as ABVP. When election results were out, Raja surprisingly got over 3000 votes whereas Rajat i.e. 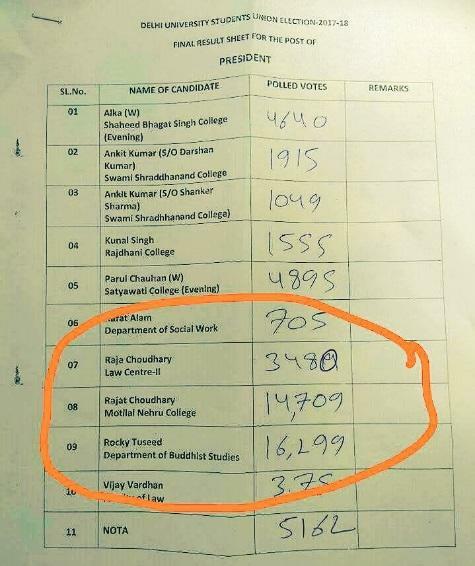 ABVP candidate lost by a margin of 2000 votes. To control this practice EC should come up with proper measures. Vigilant election machinery can always come to know about the so-called dummy candidates within the first few days of the election campaign process. Whenever such information is received, the electoral administration should alert all the field functionaries, and a video recording campaigning by suspected dummy candidates should be done. Candidates can also aware voters about dummy candidate by the proper campaign.